What a doll, and what a shooter! Good show! Hey! Thanks so much for the post! If you ever see me upside down like that on the range call 911!! Maybe they will add that event as part of the Rio games. I know everyone at the AMU will be working on that position now! See you there! Main photo is a trick shot photo. 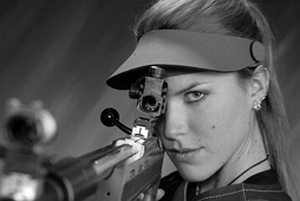 The ejection port on the Browning Bar she is holding ejects out the left side. They flipped the photo to make it work. Scope is backways and RH hand shooters would find it awkward to hold the rifle that way with their left hand.